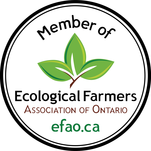 Have you ever wondered why store-bought eggs cannot compare to eggs laid by free range hens? The answer is forage. Hens that are given the freedom to seek out food will consume large quantities of grass, clover, bugs, etc… all of which help to enhance the flavour, colour, and nutrition of their eggs. During the Spring, Summer, and Fall months our hens live outside on the pasture. They are kept inside an electric fence netting which is easily moved weekly. Keeping our hens outside on pasture helps produce exceptional quality eggs while giving the chickens a happy and healthy life. Additionally, the chicken manure is concentrated on the pasture where it is needed most in order to produce a lush grazing crop for the cattle. 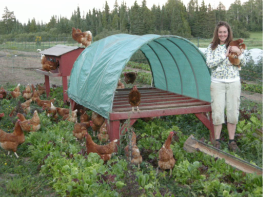 Over the winter, our hens are housed in our free-run poultry barn. 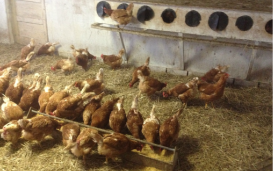 Hens are bedded with straw and provided with fresh water and grain every morning. Lighting is provided in the barn and is important to maintain the flock's health egg production. We raise our own replacement hens, rotating half of the flock every 6 months with a new shipment of day-old chicks from a professional hatchery. 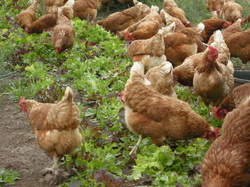 Contact us if you are interested in a some of our 18 month old layer hens for your backyard flock!